Towards the beginning of August, it looked like my summer was ruined. We had taken a fun trip up to Bowman Lake in Glacier National Park, where we rowed and sailed our new Vermont Fishing Dory up to the end of the lake and took a nice hike. 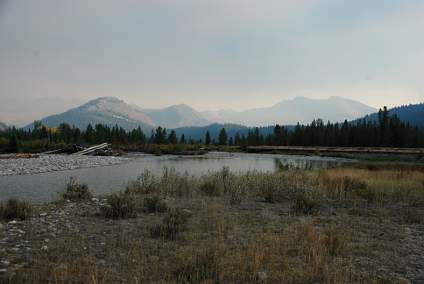 I had been looking forward to taking a short back-country trip with friends from Colorado and back east, and Dona and I had done some reconnaisance up by Gray Wolf Lake. But three days before our friends arrived, my back went out. I could barely get dressed in the morning, let alone ride or hike or backpack anywhere. And then Dona's back started bothering her too. I went to my chiropractor, which helped; and we both started going to a physical therapist, which helped some more; but it was clear this was going to be a long recovery process. I resigned myself to a lost summer. 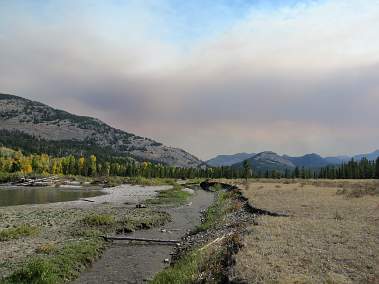 I had been hoping we could do something I've wanted to do for years, and that is ride from the northern part of the Bob Marshall Wilderness all the way down to home. Now another year was going by, and it wasn't going to happen. 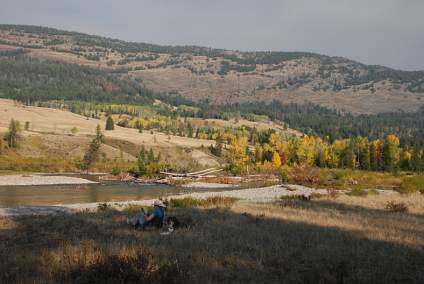 I had also been hoping to do a late fall trip down the South Fork of the Flathead, and that wasn't going to happen either. I tried to keep a smile on my face, but it wasn't easy. 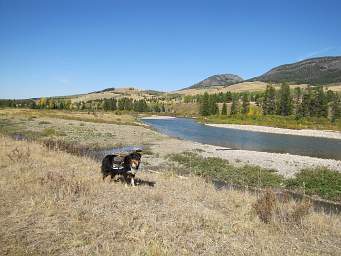 After about three weeks, I ventured out on Poppie and rode across the river with my water measuring equipment to measure the flow in a spring creek I monitor over there. It isn't very far, but even so I had to support my weight with a hand on the horn so the slight thud of hooves hitting the ground didn't jar my back too much. Things slowly got better. 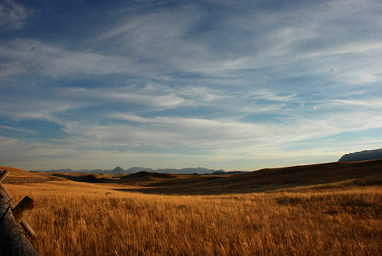 Towards the middle of September the rains started coming, and hunting season opened in the back-country. The weather was now problematical, with snow and rain pretty much a guaranteed on any long back-country trip. We had obligations and no big blocks of time available. I thought about it pretty hard every day when I went out to feed the horses, and finally I decided I might not be well, but I was well enough. Well enough to ride without too much jarring, and if I was careful how I lifted things and the panniers weren't too heavy, well enough to pack Scheba. She's a Haflinger, and not too tall, a good thing in this case. So I consulted with Dona; she was game to go, and we decided we had a ten day window coming up the next week. We keep a pretty good supply of back-country food at the ready, and we had one last trip to town planned where we could buy the odds and ends we still needed. We decided Max should start carrying at least some of his own food, so we invested in a doggie pack. 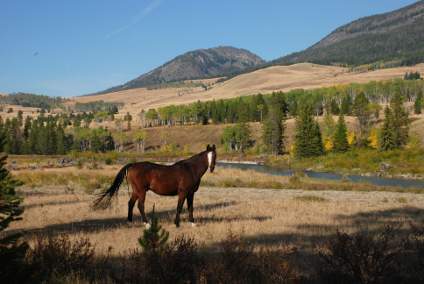 During the next week I took a few trips across the river to try to get the horses in a little better shape. I had Max pack his doggie pack to make sure it worked ok. He seemed to think it was the equivalent of the shock collar. He never likes that being put on, but then does fine once we get out. Anyway, he did fine with it. I loaded it up with six days of food and decided that was about all we should saddle him with. 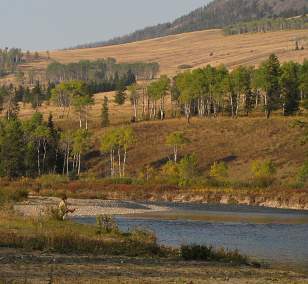 We poured over the map and decided we didn't have time to do most things, and with hunting season open in the western part of the Bob it seemed like the best thing to do was to spend time in the Sun River Game Preserve. 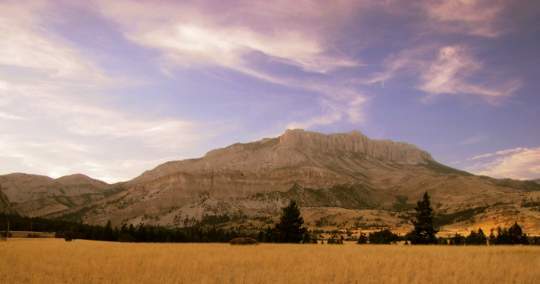 That includes parts of the Chinese Wall, which Dona had wanted to visit for a long time; and it also included Prairie Reef, which I we have both wanted to get to the top of. 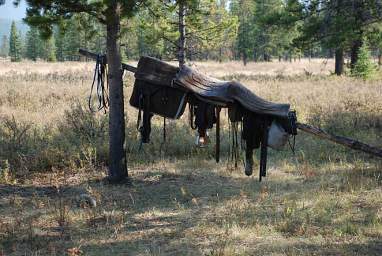 Ten days is on the edge of what we can do with one pack horse, and I didn't want to bring two because our horse trailer only holds three horses. 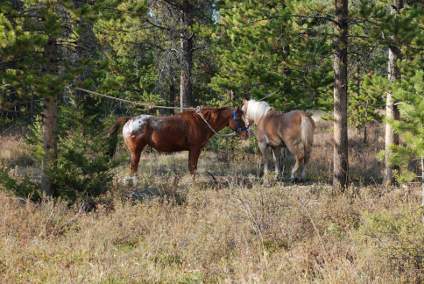 If we took four horses we would have to borrow a truck and trailer from a neighbor; our trailer isn't big enough, and our truck is only a half-ton and isn't safe to use on a four horse. 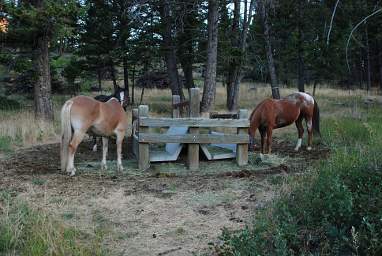 I always bring some horse feed along because sometimes we camp places which don't have a lot of grass; at two pounds each per day, that's sixty pounds of feed to start with. Max gets about two pounds a day, so we had another four days of his food. That didn't leave a lot of room or weight for our stuff, but we go pretty light and I figured we could squeeze it all in with a little extra on the saddle horses at the start. We decided to make a loop starting at Gibson Dam on the Sun River. The first four or so miles of trail is carved out of some steep rocks, and I wanted to be going up it in the morning to avoid having to pass too many people coming down. So I figured it was best to spend the night at a campground near the dam. We packed the truck; loaded up Sambo, Sky and Scheba; and Dona, Max and I scrunched into the front seat. We turned Poppie out into the pasture and asked our neighbors to check on her and make sure she had water if she hung around the barn instead of going out to the far side of the pasture where there was a ditch. We were off! We gassed up in Lincoln and headed up Roger's Pass. I was in great spirits. And then, as we started down the other side of the pass, the oil warning light came on in the truck. My heart sank. We pulled over and I checked the oil. It was down a quart, but no-where near empty. I filled it up, and when I got back in and started her up, the light went off. We crossed our fingers and carried on. As we drove on towards Augusta, I went over everything I could think of that could cause the oil light to go on when we weren't low on oil. I convinced myself it couldn't be a catastrophic oil pump failure; maybe it was intermittent, or the oil sensor was intermittent, or the pump was about to go but not dead yet. It was nearing five o'clock when we got to Augusta, the only town between Lincoln and the trailhead. We tried to find a mechanic to check out the oil warning, but couldn't locate one. We grabbed a burger at Chubby's Dogs and Burgers, chased down with ice cream and shakes (great burgers and ice cream!). I thought about the wisdom of continuing on. The engine hadn't frozen up yet; if we hung around and tried to figure out what was wrong we might not make it to the campground at all; and if we didn't make it tonight we wouldn't get started when we needed to in the morning, and we would lose a day and not have time to do the trip we had planned. I really wanted to do this trip, so I crossed my fingers and we headed off into the sunset. Hopefully we could make it to the trailhead. I didn't want to mess with the truck now; I needed to get away from civilization, and was willing to worry about the truck after we were out of the back-country. Wow! The Rocky Mountain Front is one of the great sights of the world as far as I'm concerned. We had a clear blue sky as we drove westward. 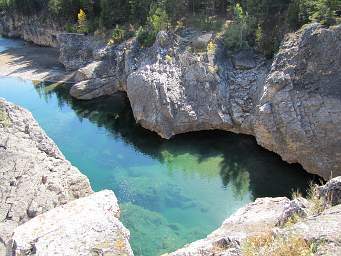 We arrived at the base of the dam and I held my breath as we geared down into granny to make it up the steep grade to the top of the dam and then down the other side to the campground. The oil light stayed blessedly off. We pulled into the campground to look around for a site. Something wasn't quite right, as there were no facilities for stock or stock trailers, and there were quite a few campers parked with no vehicles by them. Upon closer inspection we discovered the stock facilities were a bit further down the road, so we moved down there. Once there, we discovered there wasn't any stock water, and we weren't allowed to camp there. 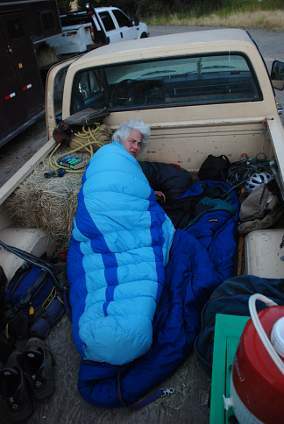 I get pretty upset when told I can't camp somewhere, yet people with big expensive gas-guzzling rigs are allowed to park their giant lumbagos and sleep all night, or bozos with semi-trucks are allowed to pull over and sleep in the back with their damn rigs running all night. So we fed the horses, gave them a chance to drink out of a bucket (we had water with us in the truck), tied them up for the night, and rolled out our bags in the back of the truck. It was a clear, moonless night; we identified some new constellations and drifted off to sleep. After a wonderfully quiet night, we awoke to sunshine and a new day. While we were nibbling breakfast and packing up, another rig pulled in with a big trailer, empty. A fellow got out and just kind of stood around. I nodded to him and he nodded back. As we mounted up to head off, the fellow with the empty trailer informed us he was there to meet a string coming down, and they were supposed to be there by ten. Horses at the Feed Trough Good Morning, Dona! Ugh. I was a bit annoyed, as this was clearly an outfitter. Generally speaking, early mornings are unofficially for traffic going in, and I figured at least outfitters with big strings would heed that. Wrong. He said we might want to wait for them to get out before we started up past the first point on the reservoir. We started up the trail; I kept an eye out for good places to pull off as we wound our way along above the reservoir. Just before we got to the first point, where the cliffs started, the string coming down showed up. We turned around and backtracked a bit to a good place to pull over, then rode up the steep hillside to let them pass. The good thing about Halflingers is they are short, so it's relatively easy to lift loads up to place them on the packsaddle. The bad thing about Halflingers is they are round as a barrel, so it's relatively more difficult to keep those loads centered over the horse. The other thing about our particular Halflinger, Scheba, is that she is best describes as a "dumb blonde." She doesn't pay much attention to what's going on at any particular moment, and instead of standing quietly while the other party passed us on the trail, she ploughed ahead on the hillside through some dead branches. One of them caught her pack, added a little resistance, and the packsaddle started to roll around to her belly. I guess another good thing about Halflingers is they are pretty docile, and don't get easily excited. She calmly stood there while I rearranged her pack back where it belonged. We had a pleasant ride on up the trail to Reclamation Flats near the end of the reservoir, where we stopped for a bite to eat. 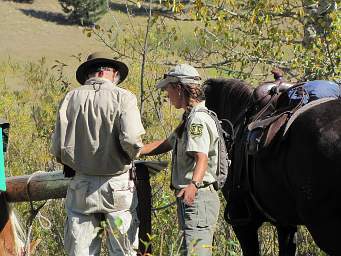 As we were resting, a young Forest Service Ranger rode down from the direction of the North Fork of the Sun River, leading two mules and trailing a black lab. We had a nice chat and she filled us in on trail conditions, and informed us one of the trails we were intending on taking hadn't been cut out in years. That was the trail leading from Bear Lake northeast to the North Fork of the Sun. Our plan had been to camp a little bit below Bear Lake, so we could check it out; and then head up the North Fork. But with the one trail closed, it meant we would have to back track quite a bit, and that would mean we would have a pretty long day the next day. Dona could only ride a certain amount without bothering her back and ankle, so we decided to skip Bear Lake. We finished up lunch and left Reclamation Flats. Because it was late in the irrigation season, the reservoir was drawn down, and for the last part of the trail we could get an idea what the river must have been like before the reservoir went in. It must have been very pretty. Even with the bathtub ring of the reservoir and twenty or so feet of barren bank and mudflats, you could see how pretty it was. Maybe someday we will be able to take that dam out and restore this pretty section of the world. We crossed the North Fork of the Sun, then headed up a short cutoff trail that after a few miles would come back to the river. As we rode up through the trees, the woods started talking to us. We couldn't see them, but the elk were bugling. It would be a recurring theme for the whole trip. What a treat! 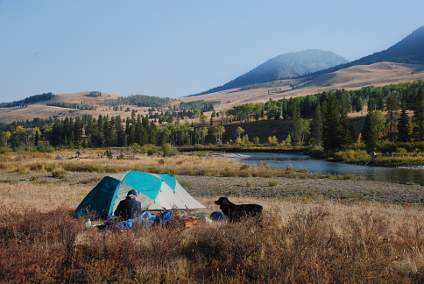 The trail led back to the river, and as it was getting on towards late afternoon, we looked for a good camp. The North Fork of the Sun is flanked by wonderful meadows for most of its journey, and it didn't take long to find a good spot. We unloaded the horses and set up camp. 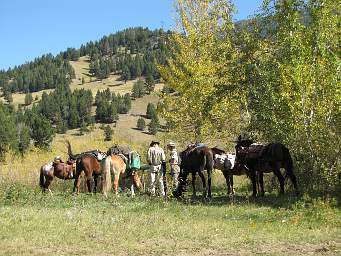 I turned the horses out one at a time to graze, not wanting them to head back down the trail. This was only Sambo's second overnight trip, and I still didn't have him broken to hobbles. The first time I worked with him I had used a three-legged hobble, and he broke the strap between the hind hobble and the front ones. Any time a horse breaks something it's the wrong kind of reinforcement; they just learn they can endure a little pain and then be free. The result of that episode had also burned his pasterns a little, and I didn't want to mess him up and ruin the trip by having something like that happen again. I had made up some new hobbles that were wider, both in the pad and with a two inch hobble strap instead of the normal one inch one. I got him used to those at home, but at this point he hadn't figured out how to walk with baby steps. He just stayed in one place and figured he was rooted to the ground. I wanted him to get a good belly full of grass, so at least this first night I turned him lose by himself without hobbles. I was hoping the horses would get used to being around camp and treating it as home. 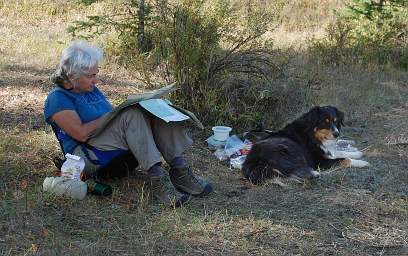 Dona relaxed with the map and a book; Max was tuckered out from carrying his new pack, so he kept her company. 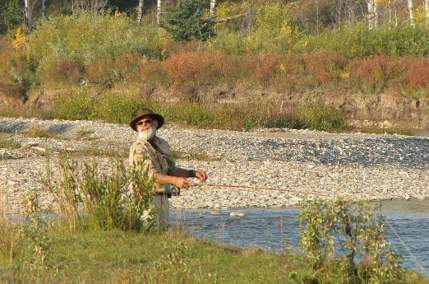 I got out my fly-rod and went fishing. Sambo was out grazing, and suddenly he started whinnying and carrying on. I looked up to see him trotting off to the south. I thought another string of horses was heading our way, but it turned out to be a bull elk who had come out to investigate. Apparently he was worried Sambo might be stealing his girls, and Sambo was worried the elk might be up to the same thing. 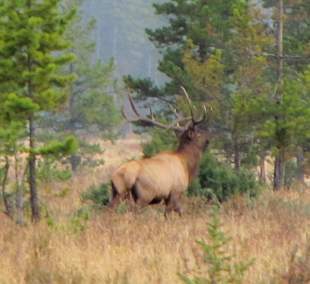 They warily approached one-another, did a quick investigation, and then the elk returned from where he had come. 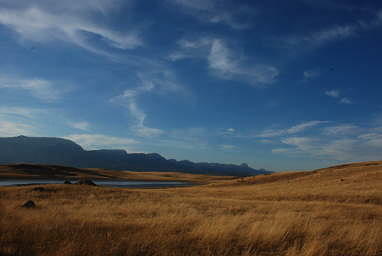 It was a gorgeous clear night, and we slept under the stars with an occasional elk bugling to remind us where we were. We had the tent set up in case we got too cold or some unexpected weather blew in, but it just sat there unused all night. The next morning we headed on up the North Fork of the Sun.